Archaeological mitigation can all too often be regarded as a preamble to construction activities, rather than a mainstream element of construction process. Yet since the 1980s, Commercial Archaeology and the Construction Industry have co-existed. The advent of Planning Policy Guidance (now National Planning Policy Framework 2018) mandated that suitable archaeological mitigation takes place whenever there are large and impactful construction works in areas of known or potential archaeological significance. Some of Britain’s most exciting and ground-breaking finds have been discovered as the result of pre-construction works even before NPPF; the Mithraeum in London, a hugely significant Roman structure was only discovered because of clearance works before post-war rebuilding in the 1950s. Historically archaeology was a “gentleman’s pursuit”, a sort of extended version of the Grand Tours taken in Europe in the 18th and 19th centuries where wealthy individuals could indulge their passion for antiquities by collecting them as they made their way along the shores of the Mediterranean. Within the UK the Society for Antiquaries formed in 1707 to promote the study of the past. Since then archaeology has evolved from a dusty hobby to a recognised profession with its own chartered body, The Chartered Institute for Archaeologists (CIFA), which promotes and supports archaeologists working in Commercial Archaeology in the UK. Archaeology even has a category under the Construction Skills Certification Scheme (CSCS). Engineering and Archaeology as disciplines have different drivers, perspectives and desires. However both groups need each other to successfully develop and deliver projects. Without construction there would be very limited scope for large scale archaeological excavation and investigation in the UK, and without archaeological mitigation many developments would never make it out of planning stage. Despite often being viewed as an obstruction or a potential cause of delay, perceptions are beginning to shift. 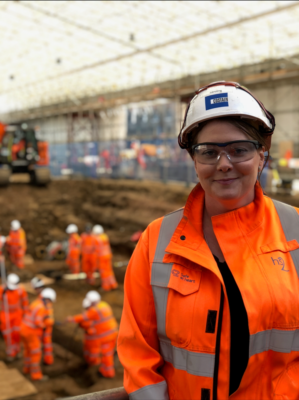 At HS2’s Enabling Works Contract in Area South, Costain Skanska jv is carrying out archaeological work well in advance of the main construction phase, permitting a targeted and specific approach to the works without concern for major programme delay. An excellent case in point is the work at St James’s Gardens in Euston where 40,000 burials are currently being archaeologically excavated to permit the creation of the new Euston Station. The works in St James’s Gardens represent a project of unparalleled complexity in terms of the engineering and design works which were required to allow the excavation to take place. In a very real sense we have engineered for archaeology on an unprecedented and unique scale. By using in-house archaeological know-how, engineered design and pre-planning to solve archaeological issues, the St James’s Gardens team have been able to deliver a bespoke encapsulation structure. The structure not only fulfils stakeholder requirements but is environmentally sustainable and also maximises the potential for a safe, efficient and ground breaking archaeological dig in Central London. By blending archaeology and construction and taking a more open-minded approach to managing groups which have traditionally been regarded as “non-standard construction functions”, we can improve productivity, increase understanding and work to more cost effective and efficient outcomes. This is evident at St James’s Gardens where the initial planned outputs by the archaeological teams have now been increased five-fold through introduction of engineering initiatives and innovations such as small electric and hybrid plant to reduce hand digging and mitigate manual handling risks. Archaeology is also often overlooked as the contractor’s best route to inexpensive yet valuable community engagement. As construction contractors, the demolition of a building or the diversion of a utility do not often spark the public imagination, yet archaeology is a great tool for engaging with the public and local community. By allowing the archaeologists to actively promote the works, findings and engage people in understanding the human story, the journey for the construction teams inevitably becomes easier. Archaeology can and should be viewed as a potential plus point with many positive outputs if it is managed and planned in an integrated fashion. Championing and supporting archaeological works promotes a sense of inclusivity, establishes educational/ academic credentials and exhibits a willingness to share knowledge. It can also act as a focal point, creating new bonds or links within the community within which we are working. A huge number of positive benefits which should not be underestimated, so dig in and embrace archaeology!